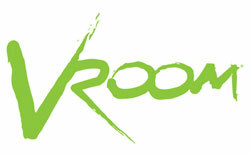 Vroom is a great addition to your In Home Vacuum System! It can connect to your central vac system or with a standalone unit. 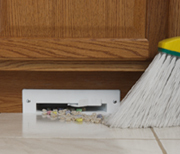 Gives you the convenience of a broom and dustpan with no stooping or bending. Turn it on with a toe switch, sweep crumbs toward the inlet and watch the powerful suction whisk them away. 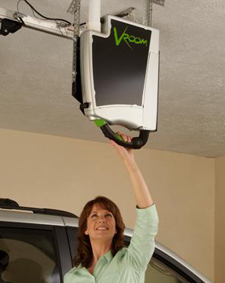 Utilizing a unique hanging bracket and readily available fixtures, the Vroom can be mounted from the garage ceiling for easy accessibility. Once installed, a user simply has to reach up and take hold of the hose handle to clean out multiple cars or other garage items. 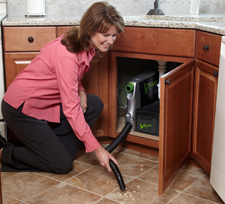 Unlike traditional garage vacuums, the Vroom Garage is unique in the fact that it takes no additional storage space. The ceiling suspension provides the user with a service bay experience. 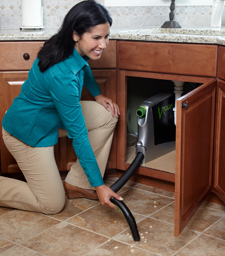 When you don’t have a central vacuum system or cannot install one, Vroom Solo delivers standalone convenience with its own power unit and dust collection bag.